Hi! visit me at catlover-at.blogspot.com.au/ have a blast!!! 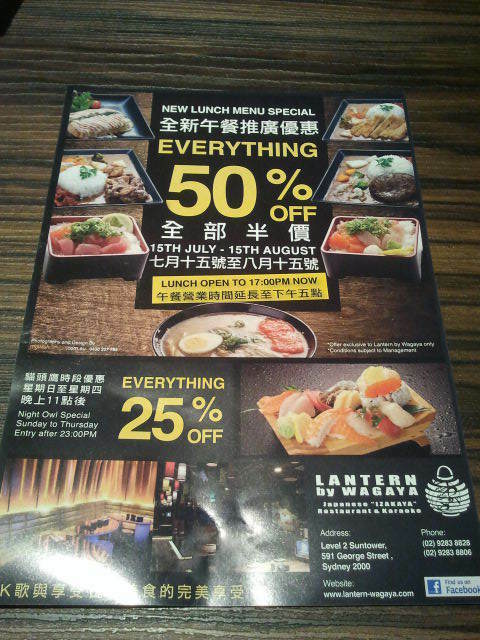 From the 15 July 2013 to 15 August 2013, diners and Japanese cuisine fanatics can enjoy 50% off lunch dishes at Lantern by Wagaya on George Street, Sydney. As the name suggests, Lantern follows the success of its predecessor, Wagaya, which offers Japanese cuisines such as sushi, don-dishes (rice dishes), ramen, assorted tempura udons, curries, and assorted salads. But the novelty does not end there. What is special about the Wagaya franchise, including the newcomer Lantern, is that they also offer karaoke rooms and lunch/dinner - that is, eat while you belt out some tunes to impress your date. 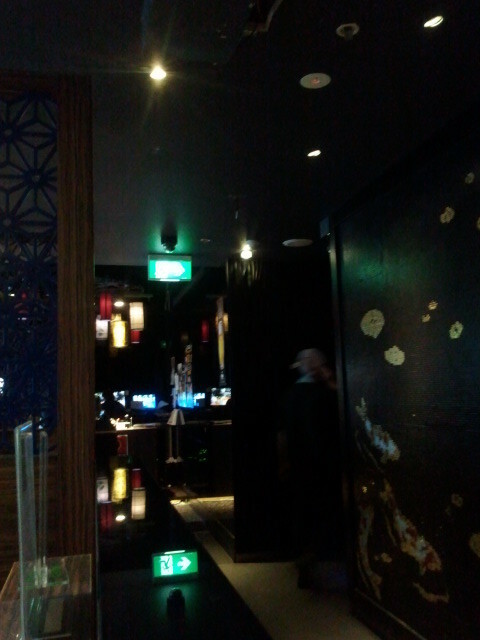 Conveniently hidden, Lantern is located on Level 2 of Suntower on George Street, opposite the Sony shop front of World Square. I am sure if you are a frequently city-dweller you will know what I am talking about, otherwise, during this time, there will be some very pretty young ladies handing flyers who will be more than happy to show you the way. What attracted me to Lantern was indeed the 50% off flyer handed out by one of these pretty ladies as I walked down George Street. At first I was a little wary of the fact that Wagaya is a high end restaurant and their prices may be over the top, but the promotion was very tempting so we made our way across the road. 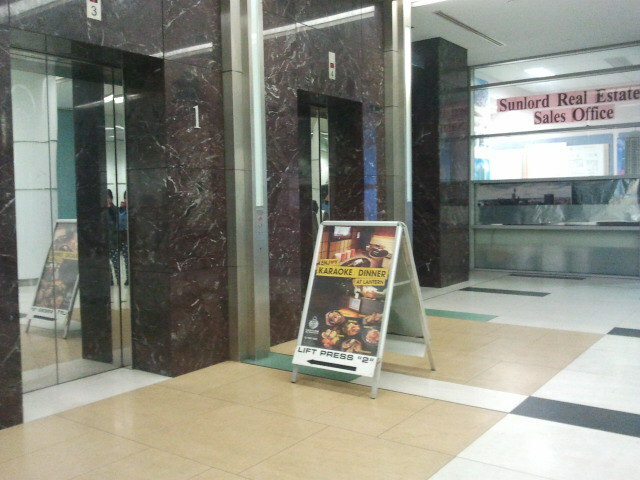 Upon entry of the building, the lifts are easily visible and a sign directing potential customers to go to level 2, which is really only one floor up. As soon as I got out of the lift, I was greeted by reception who asked the usual - "How many people. Are you here for lunch?" - and informed me that "everything on the menu is 50% off, but not for alcohol and takeaway" and asked "can you finish your meal in one hour?" That's when it hit me; lunch finishes at 5pm. But that was no problem at all. After agreeing to all "policies" thrown at me, we were taken through a maze of cubicles and karaoke rooms to our cube, which was quite spacious. On our way in, I noticed that not only the waitress taking us in but all waiters and waitresses were wearing what appears to be headsets. 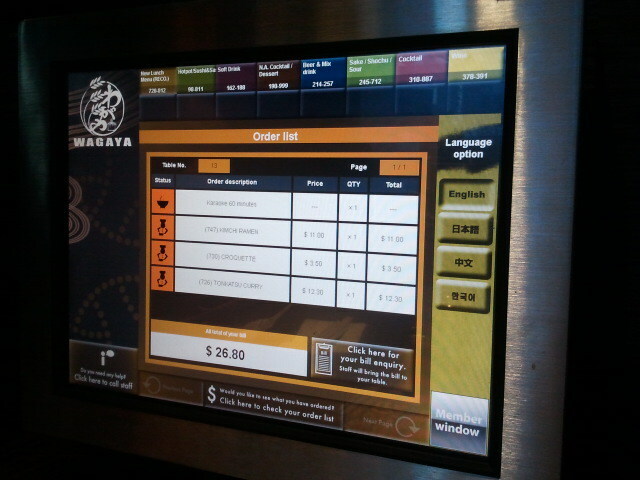 The waitress introduced us to the ordering system which is similar to most newly opened restaurants. Customers order through a touch screen system and the menu is divided into lunch menu, drinks, alcohol, soft drink, cocktails/desserts, Sochu and wine. However, customers had to agree that no alcohol will be served to people under 18 before they were allowed to see the menu as the agreement was made on the screen. [ADVERT]Service is fairly quick. We had a couple of enquiries about the items on the menu and couldn't wave down anyone as there was no one in sight and didn't want to use the call service button. But after a little while of pondering, we decided that it was there for a reason. Customer service was absolutely praise-worthy, only a minute or two after I pressed the button, someone was there to answer my queries. Usually I have to wait about five minutes. 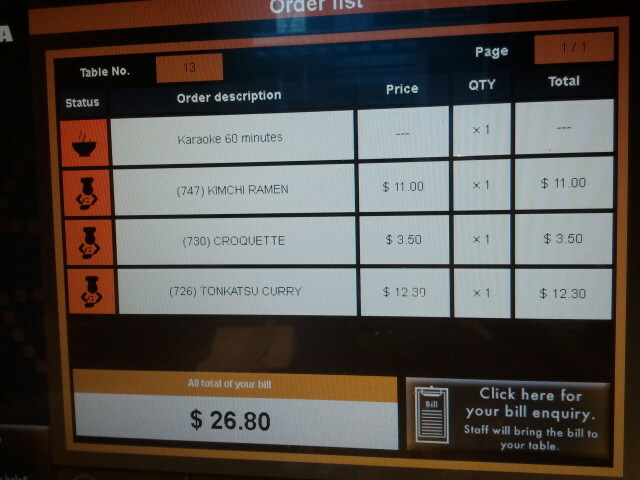 After all queries were answered, we decided to order a kimchi ramen, a side of croquette, and tonkatsu curry. Word of warning, patrons eating at this restaurant should really believe the picture as it does not lie. Thinking that our items would be small, I made the mistake of ordering the side of croquette. Customers can see on the screen what they have ordered and their foods' status which was quite amusing. Our orders came out quite quickly, within minutes of each other. 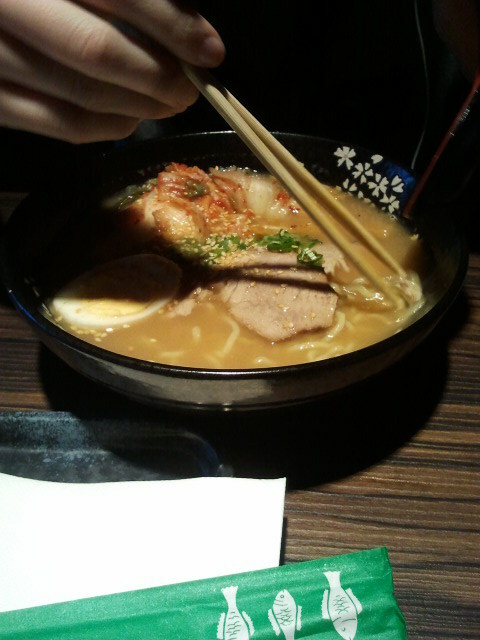 The kimchi ramen was okay, although not really different to others that I have had and was quite mild. 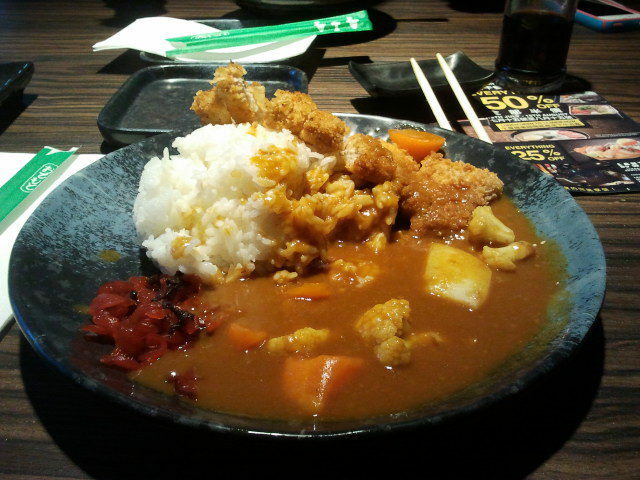 My tonkatsu had a lot of fat in it which was quite disappointing, but the curry was really good, although I would have liked a little bit more potatoes. I am not really sure if its just my luck or if everyone gets the same. 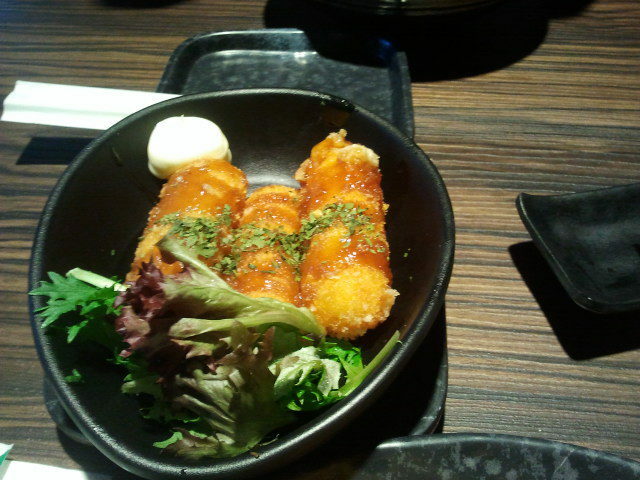 On the other hand, the same cannot be said about the croquette. The serving consisted of three medium sized crumbed and fried potato fingers, served with a side of mayonnaise. The potato was fluffy, hot and crunch, all at the same time. Price-wise, dishes are a little overpriced, but the promotional month is a good way to introduce their lunch menu. Although, patrons choosing Lantern's karaoke-dinner option may just get more bang for their buck if they arrive in a big group and split the cost. Overall, it was a good experience. I would recommend coming here for a quick lunch or a lunch meet up for those who can afford a $12 dish, otherwise, get your friends together for a karaoke session as Lantern is conveniently located away from the public.